This challenge runs through Saturday, October 14th at Midnight EST. House Mouse and Friends Monday Challenge blog and check them out. you are always welcome to use an anything goes theme with all of our challenges as long as it includes an image of a House Mouse Designs, House Mouse, Gruffie or Happy Hopper. Such a fun card Sue, a super image and fabulous colouring. Hiya Sue...hope this finds you and yours well!! It's been way too long since I paid you a visit...I'm missing all my mousey friends! Love, love love this sweet card...beautifully done as always Sue! Your card is so adorable. Love the image and your coloring is fantastic. Oh, so cute! And I love your candle card, too...beautifully done! 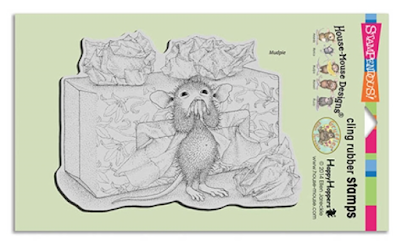 Darling House Mouse design and pretty coloring on your delightful card! Love the costumes on the mice. the one in the paper cup is darling. This is precious-I love all the mice. Again your coloring just blows me away! I love the costumes. These mice are ready for some candy! This card is eye candy, too. Great coloring and I love the ribbon and embellishments. Spooktacular, just adore House Mouse! Them are some super sweet trick or treaters! Love that big beautiful pumpkin! Gorgeous card! CUTE spooky... love the costumes~~~ Thanks for sharing!